Boat Travel Lift For Sale Can Increase Efficiency Improve Work Condition Save Much Energy! Great Choice For Boat! Boat travel lift for sale is great equipment for lifting and transporting boat. It can move in diagonal direction, it can also steer in 90 degree or do pivot steering. This travel lift can put the boat in any designed position according to requirements. Boat hoist can make the boat in order quickly, it can adjust the gap between each boat according to different condition and reduce wasted space. Ellsen, a professional and well-known travel lift manufacturer in China, supplies top marine boat hoists for sale. 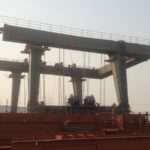 Ellsen designs and produces travel lifts gantry crane according to national standards, international requirement and customers’ needs. Low price, high performance, easy operation, simple maintenance! Buy reliable boat travel lift from Ellsen! This kind of gantry crane has two types of drive, hydraulic drive and electric drive. This makes the equipment has high efficiency and powerful drive. Boat marine hoist is amphibious. 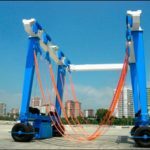 It can be used for lifting the boat from water, and can be applied for transporting boat or other material from one place to another place. 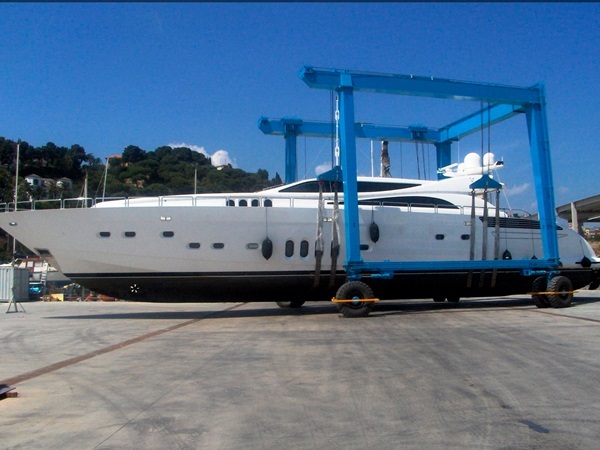 It is also used for maintaining vessel. For control way, this machine has two control ways. Cabin control and remote control. For cabin control, the operator sits in the cabin and move along with travel lift at the same time. For lighter duty, customers can choose remote control, it is also convenient. For move, it has 360 degree concentric steering. Thus it can move towards any direction flexibly and easily. With the function of oblique movement, rubber tyre travelling mechanism makes an easy travelling. Smooth move makes it flexible to operate. Boat hoists are crucial in areas where ice forms in the winter. Watercraft left in the water generally will be crushed when ice forms. A boat hoist prevents the possibility of such damage. A boat hoist can be a costly purchase, and so it’s advisable for boat owners to measure the boat to ensure a good fit, both fore-to-aft and beam. Likewise, a good estimate of the boat’s maximum weight, including equipment and full fuel tanks, should be taken to guard against installing a boat hoist with an insufficient motor. If the hoist will be operated by a remote control on the boat, the maximum weight of passengers should also be included. 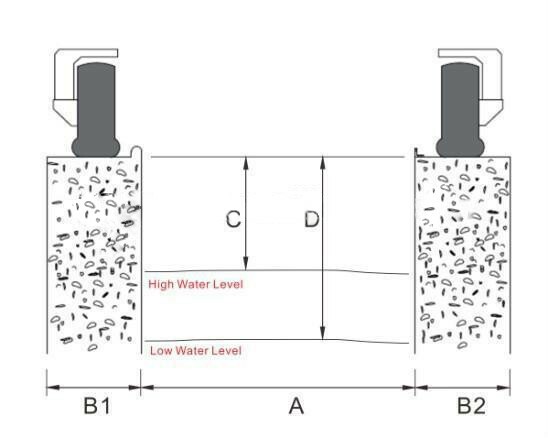 In addition, variances in the water level due to tides or human activity are a major consideration in determining the type of boat hoist to install. 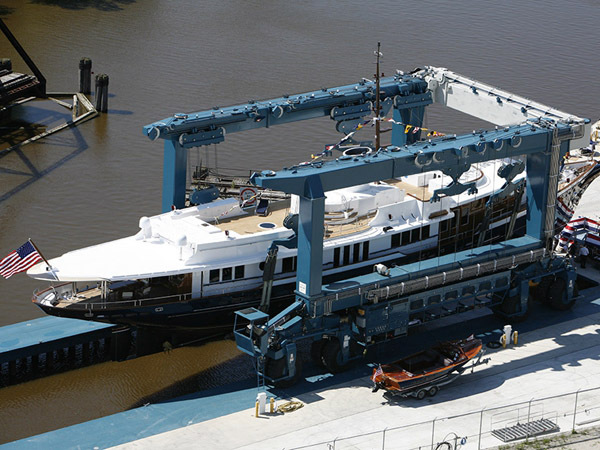 Ellsen boat travel lift has available lifting capacities from 20 tons to 1000 tons. 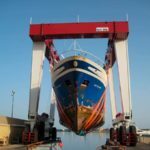 If you want to lift your boat out of the water safely and stably, just choose Ellsen marine travel lifts. 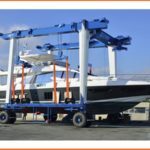 Ellsen provides various types of mobile boat lifts in the market. All Ellsen boat hoist crane is built based on the latest standards of proficiency and safety, legal regulations and requirements. In addition, Ellsen ensure lower maintenance costs and customized service. 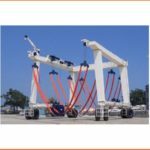 As a professional travel lift supplier, Ellsen produces boat lift crane with high quality components, and has a heavy-duty paint system to ensure durability. Careful painting can protect the device from dust, rain, corrosion, seawater, wind and sunshine. Ellsen offers custom built design due to in-house design. 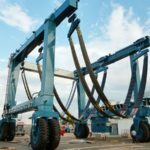 We are able to build marine hoists, travel-lifts and mobile cranes to all special requirements; our experienced engineers welcome your input. 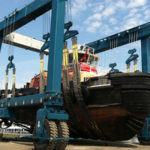 All harbor hoisting equipment is tested and inspected prior to delivery. Did you know that Ellsen machines are not only sold worldwide but also globally serviced? Ellsen never sacrifices quality in favor of cost savings. Our highly skilled and motivated team ensure the delivery of a machine with low maintenance, low operational costs and a safer working environment for the operator and staff. If you are looking for quality, safety, durability and environmental friendliness, you should give us a call!